OSWEGO, NY – Rotarian Heathe Jones introduced Greg Mills, director of the Oswego-Fulton Chamber of Commerce, at a recent Fulton Noon Rotary meeting. Mills discussed his vision for the new year for the chamber. Mills was appointed the executive director of the chamber last October. Danielle Hayden is the assistant director. The chamber supports businesses in Fulton and Oswego, as well as, several other smaller communities in Oswego County. Its goals and objectives for 2015 are to find resources from members and facilitate networking and connections at twice a month meetings. The chamber has two meeting each month which are “mixers,” designed to share ideas to make the chamber more effective and meaningful for its members. The staff of the chamber of commerce has a very difficult job to serve two fairly large communities, and many smaller ones fairly. The staff is working on ways to rebuild trust, faith and confidence in the chamber members and the larger Oswego County community. 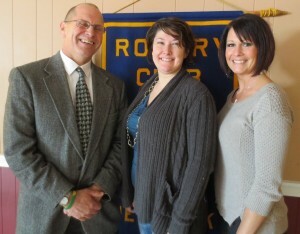 It currently has nearly 500 members in the Fulton and Oswego area. The chamber’s goal is to strengthen new and exisiting businesses.